96. Wednesday August 18th 1875. Mother took Mrs Winter to town this morning and brought Mrs Dennison home with her. I got the ironing done before dinner As soon as we got the dinner work done up I walked to town to take a music lesson. When I came home I mended the clothes and put others away. And did up the work after supper while Mother took Mrs D_ home and went for Mrs Winter. I practiced a little in the evening. 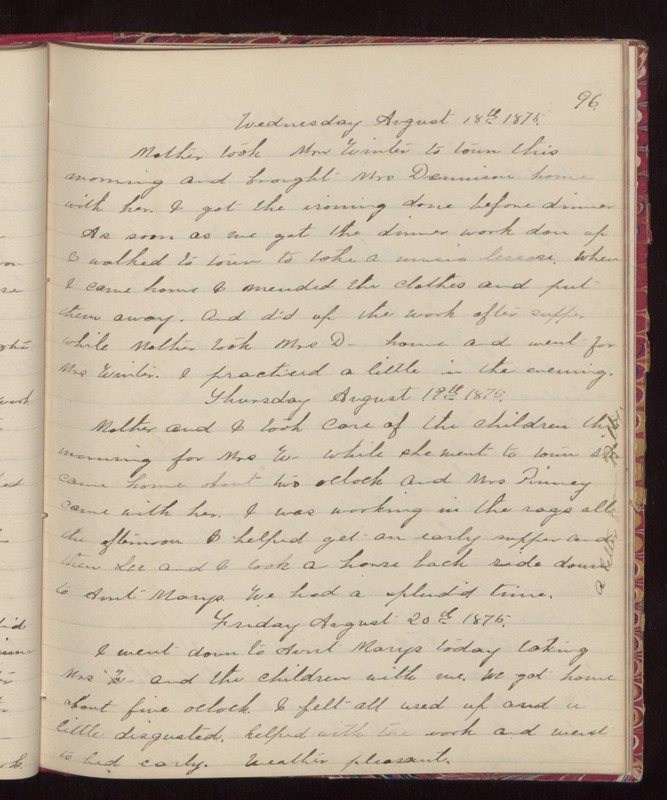 Thursday August 19th 1875. Mother and I took care of the children this morning for Mrs W_ while she went to town She came home about two oclock and Mrs Pinney came with her. I was working in the rags all the afternoon I helped get an early supper and then Lee and I took a horse back ride down to Aunt Marys. We had a splendid time. Friday August 20th 1875. I went down to Aunt Marys today taking Mrs W_ and the children with me. We got home about five oclock. I felt all used up and a little disgusted. helped with the work and went to bed early. Weather pleasant.